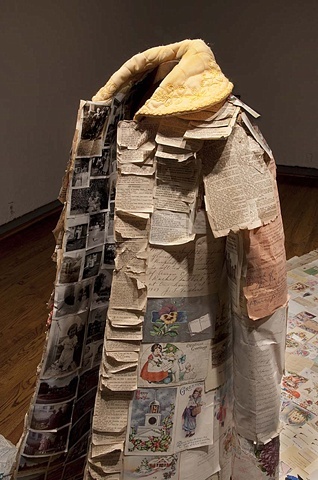 The materials sheathing this garment also give an elegiac nod to an era of interpersonal communication that is passing into memory. Correspondence has become exponentially more ephemeral with the proliferation of digital messaging. The physical embodiment of our traces, written in words and embedded as images on paper, is fading away. For better or worse, future generations won’t have many of these complex physical remains to sift through when their elders die. Accretion is also, then, a monument to these things that are the fugitive markers of our living.